They are as small as one-Angstrom diameter hydrogen, or as large as the heavyweight uranium atom, which is 238 x heavier than hydrogen. They are the stuff of life – atoms. The Greek Democritus (460-370 B.C.) proposed that matter consisted of small, indivisible units he termed “atomos”. He never saw atoms, but believed they had definite shapes and sizes. Democritus was right — today, scientists can “see” atoms. Matter is anything real and demonstrable. Matter occupies space and has weight. Science studies only the material world — what can be discovered by any of the five senses. Science cannot determine what is immaterial, or immeasurable. Something may exist, but if scientists can not detect or measure it then, scientifically, it does not exist. Science can neither prove, nor disprove, the existence of angels, spirits, demons, or God — that domain resides in philosophy and theology. Democritus believed atoms were real, but he never proved they existed. Science uses the five senses, instruments and tools to find and analyze matter. One by one, slowly and surely, scientists discovered and characterized elements such as hydrogen, carbon, nitrogen, oxygen, sodium, potassium, sulfur, phosphorous, and many others. Elements are the basic types of matter. Some elements were proven to be distinct metals, other elements behaved as non-metals. Many people recognize elements such as: gold, silver, iron, and lead. The atom’s components: electrons, protons and neutrons were discovered during studies of cathode rays, radioactivity, alpha, beta and gamma rays and fluorescence. English physicist J. J. Thomson discovered electrons in 1897 and proved that cathode rays were tiny, negatively-charged particles. An electron’s exact charge and mass soon were determined by John Townsend and Robert Millikan. Ernest Rutherford, was a New Zealander, who worked in Canada and England. In 1903, he speculated the radioactivity that Becquerel demonstrated was caused by atomic breakdown. In 1908 he showed that alpha particles were helium atom nuclei that passed through gold foil with minimal scatter or bounce back. This proved a central nucleus in atoms with lots of outside, less dense, electron space (see photo below). In1911 Rutherford and German physicist Hans Geiger proposed that electrons orbit an atom’s nucleus, like the planets orbit the sun. The proton was identified by Rutherford in 1919. Danish physicist Niels Bohr developed a modern model of the structure of atoms by integrating atomic findings of Rutherford and Max Planck’s quantum theory. In 1913, Bohr’s atomic model showed electrons orbiting an atom’s nucleus in defined energy “shells”. Further, Bohr proposed that energy is either emitted, or absorbed, as an electron moves down, or up, from one shell to another. Henry Moseley, an English physicist, showed in 1914 that each element could be identified by its unique “atomic number” (number of nuclear protons). Each element has unique properties and characteristics. Today, 92 naturally-occurring elements are known. Hydrogen has 1 proton, no neutrons. Carbon has 6 protons and 6 neutrons. Each proton and neutron are assigned a weight of 1. Thus, hydrogen has a total atomic weight of 1, and carbon has a weight of 12. 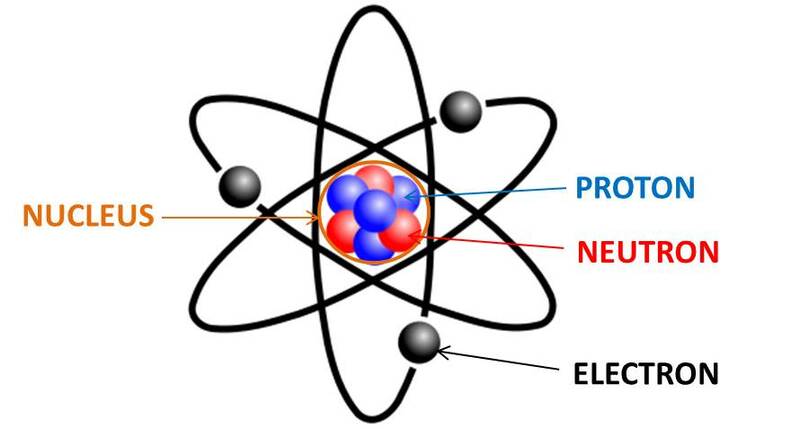 Every natural atom also has the same number of electrons as protons. Hydrogen, H, has an atomic number (= number of protons) and weight of 1 because it has only one proton. In contrast, He, helium, with an atomic number of 2 has a mass of 4 with 2 protons, 2 neutrons and 2 electrons. Atoms of elements are the smallest indivisible parts of elements that still retain the properties of that element.